The NANFA Board of Directors is pleased to announce to the entire organization that Fritz Rohde has been elevated to the status of NANFA Fellow. In accordance with the NANFA Constitution the Board is "empowered to designate Members as Fellows of the Association, such honorary title to be conferred upon those who, in the opinion of the Board, are meritorious of this high distinction by virtue of furthering the purposes of the Association." This was previously voted upon by the board in a secret session (since Fritz is our current President and member of the Board). Dustin Smith originally brought the proposal to the Board, rightly suggesting that it had been a long time since a Fellow had been selected and enumerating Fritz's qualifications. Fritz has certainly earned this honor through his service as a convention host (twice now as of last week!) and co-editor of American Currents and of course as a Board member and President, not to mention his overall support of the association in numerous professional interactions. During the Convention last week, and right before the auction, Fritz was surprised with the announcement and award. Dustin spoke eloquently and emotionally about the contributions that Fritz has made. If you see or talk to Fritz, remember to congratulate him on his new status as a NANFA Fellow. Thanks to the board for going through with this. There are few if any more deserving of this honor than Fritz. 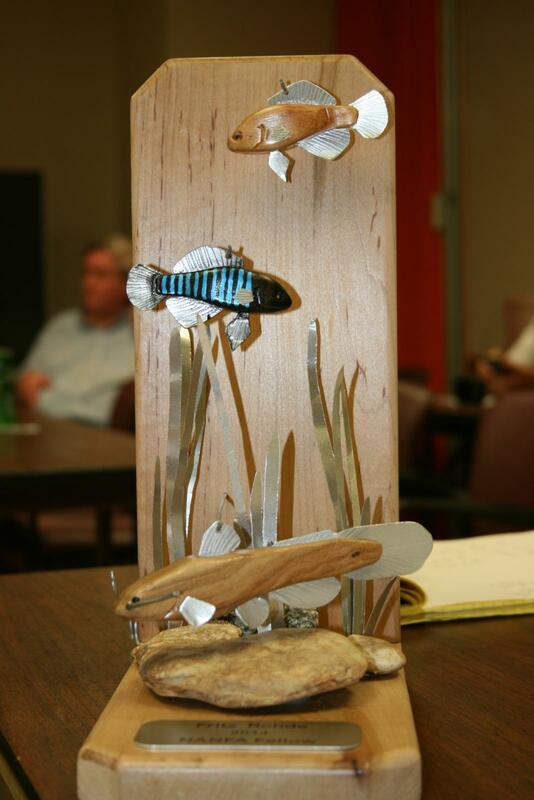 Also, thanks to Michael Wolfe for putting together a spectacular token of NANFA's appreciates to commemorate the event depicting fish that Fritz has spent an awful lot of time working with and fretting over, the bluebarred pygmy sunfish and broadtail madtom. Congratulations, Fritz! It's well deserved, from just what little I have been lucky enough to witness. Pretty snazzy award Mr. Wolfe put together for ya, too! Thanks for all you do Fritz! I think we are all very fortunate to know you, and the organization is blessed to have you. Congratulations! Congratulations Fritz! Thank you for all of your contributions to NANFA. It was a touching speech by Dustin, and it's a very well-deserved honor. Really nice work on the award Michael. Fritz, I look forward to having a brandy with you in the Executive Lounge at NANFA HQ. Congrats on this well-deserved honor. Congratulations Fritz. Even though I may give you a hard time and a few playful jabs here and there, you truly embody the mission and spirit of NANFA. Thanks for all you do. Fritz is the man, he should be recognized as such. There's no doubt, it's difficult to think of anyone who does as much for NANFA!!!! Great recognition for the old man! Congrats Fritz, we greatly appreciate all of your exceptional efforts in making NANFA a better organization. This past weekend's NANFA Convention was a great example of prime-time Fritz. Not only did he organize & host the convention, and stress endlessly that everybody was having a good time and seeing fine fish ... which we did ... but he also made sure that two more or less local youngsters were able to come out and experience native fish collecting in some great NC creeks. And they had a great time, which they'll probably remember for the rest of their lives. Fritz made that happen. It's just what he does. Proud to know you, Sir ! I think we were all that kid once. I know I was. Congratulations Fritz! You certainly deserve this honor. Nice work Dustin and the Board. Congratulations, Fritz. I'll add to the general discussion here by fourteenthing or whatever that this award is very rightly deserved.